Functional food therapeutic lifestyle change mediation/intervention program just be invented against High Blood Pressure in effective natural health therapy way. Senior Consultant,www.SkyBlueCross.com, Maxwell Chan said: There are different types of high blood pressure with different underlying causes of high blood pressure. It is terrible medical malpractice to treat high blood pressure without addressing the cause. To address the underlying cause of high blood pressure is the most important key to treat high blood pressure. To address the underlying causes of disease with a system-oriented approach, and to integrate both patient and medical/healthcare practitioner in an interactive natural health therapeutic partnership is tendency of 21st century healthcare. Functional food therapeutic lifestyle change mediation/intervention program makes use of the above Innovative health care philosophy and Developed many especial programs for many common chronic diseases. In this article, we mainly discuss how naturally to have high blood pressure well balanced controlled. 2. Something wrong happens somewhere in our body, it could be stomach ulcer or blood vessel blocked or maybe patient didn't sleep well last night. Human being body is self-organization system. 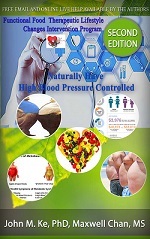 High Blood pressure is system self-protection mechanism against something bad happens in the body. High blood pressure is not a sickness, but kind of liver metabolic status instead, which may be complicated problems connected to liver, kidney, and spleen functions. Each high blood pressure patient has its particular underling cause, simply applying a lifelong taking blood pressure prescription to all high blood pressure patients could be medical malpractice. also give out 11 common underlying causes of high blood pressure and related medical solutions.